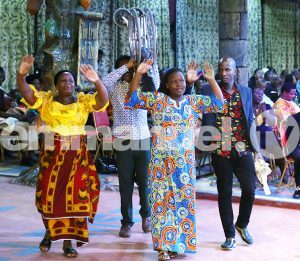 The Heavens were opened in The SCOAN as the congregants gathered in the name of Jesus, praising God and making melodies in their hearts as the choir led them in Spirit-filled songs which ushered in the sermon of the day titled: How To Be Filled With The Spirit. 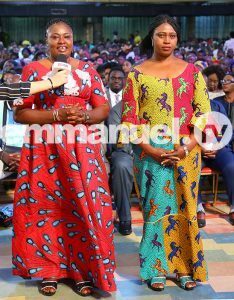 Citing Acts 10 and John 14:26 as Proof Texts, Prophet T.B Joshua expounded on why we cannot do without the Holy Spirit, “You must be filled with the Holy Spirit to be a Christian. No one can do the work of God without the Holy Spirit. Doing it without the Holy Spirit is tantamount to taking huge pain, affliction, trouble. You are inflicting pain and harm on yourselves”. Furthermore, he revealed the role of the Holy Spirit in our daily lives. “What is the role of the Holy Spirit? A Spirit – pure, sane, gentle, wise and loving – for that is exactly what He is like. The Holy Spirit is wise for He is the Spirit of wisdom. He is true for He is the Spirit of truth. He is like Jesus, because He has the Spirit of Christ. He is like the Father because He has the Spirit of the Father. This Spirit wants to possess you. This Spirit wants to be Lord of your life”. Admonishing all on the need to get hold of their heart, he stated, “Don’t allow your heart to control you. As a Christian, speak to yourself in psalms, hymns and spiritual songs. Make melodies in your heart. That is how to receive. By the time you get hold of your heart, you are about to be filled. The real battle is in your heart. If you can get hold of your heart, the sky is your limit”. This serves as a wakeup call to all Christians to be alert and take hold of their heart instead of letting the affairs of the world distract them. After listening to such a soul-lifting sermon, the congregants were ushered into a short prayer session “Lord, locate me in Your mercy; locate me in Your favour”. Below, are some wonderful, faith-building testimonies that were shared during the service, stirring the atmosphere to the glory of God. NO LONGER A BURDEN – I CAN WALK AGAIN! 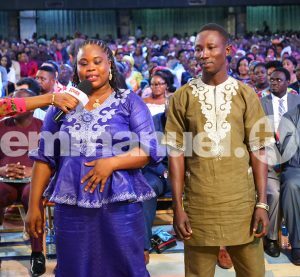 Affliction crawled into the life of young Miss Agatha Onuh, leaving her crippled for over five years. She suffered from inability to walk due to muscular spasm coupled with lumbar spondylosis which left her bedridden and in an agonizing state. No longer able to go to school, young Agatha became saddened as the ailment almost thwarted her future. The entire family was greatly affected as the pain of one turned to the pain of many. In search of a solution, her mother took her to several hospitals where she was administered the best of drugs, yet solution seemed far. Convinced that they had done their best, her doctor gave her a neck collar to ease her pains and a wheelchair to move around. 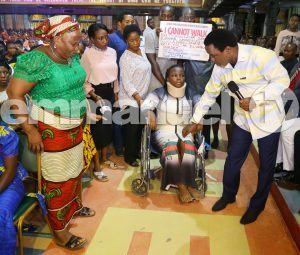 Longing to walk again, young Agatha requested to be brought to The SCOAN. As Prophet T.B. Joshua approached her, the mother felt a sensation on her body. The Prophet instructed her to drop the sensation on her daughter. As soon as she did, Miss Agatha stood up immediately from her wheelchair and started walking to the glory of God. 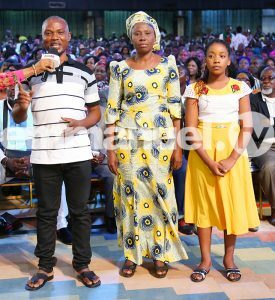 As they testified during The SCOAN Live Sunday Service, Agatha’s mum recalled in tears of joy, “I was always carrying her everywhere. My daughter was completely helpless. I thank God for taking away this burden”. 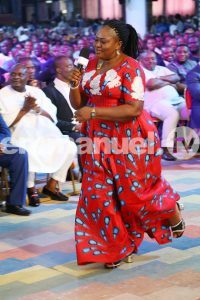 To demonstrate the perfect healing she received from our Lord Jesus Christ, Miss Agatha Onuh walked majestically to the admiration of the congregants and viewers all over the world. Another life-changing testimony that left millions astonished was a woman who was healed of blindness. Mrs Vinolia Edith was one of the victims whose sight deteriorated by each day that passed until she was reduced to seeing nothing but only darkness wherever she turned. In order for her sight to be restored, she agreed to undergo a surgical operation at one of her native Ghana’s top hospitals. Her sister, Mrs Yaa Faustina, learned of it and encouraged her to come to The SCOAN instead to seek the face of God. 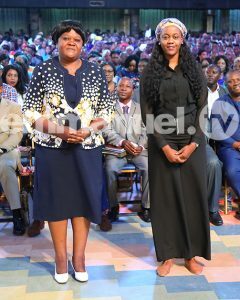 Succumbing to attend one of the Sunday Service, she followed her sister to The SCOAN as she was led in by the arm and positioned for prayer. As Prophet T.B. Joshua came closer to where the pair were seated, Mrs Yaa Faustina signaled to her blind sister that the Man of God was around. With faith, Mrs Vinolia Edith cried to Prophet T.B. Joshua to heal her from the blindness. The Man of God Prophet T.B. Joshua prayed and touched Mrs Vinolia Edith over the eyes, asking her to look him in the face. A repeated “Thank You, Jesus! I can see!” from Mrs Vinolia Edith quickly filled the atmosphere. Healed of blindness, Mrs Vinolia Edith began to shake hands with members of the congregation, identifying colours of their clothes. She recalled in her testimony that she saw a bright light when she looked at the Prophet in the face. 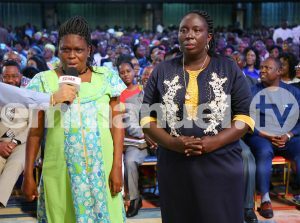 Advising viewers all over the world, Mrs Vinolia Edith strongly urged anyone in her previous case to turn to God for solution. For two agonizing years, Mr Uche Kizito had been rendered incapacitated as a result of a fractured femur. During the antagonizing stint of searching for solution, Mr Uche from Benin Republic, went for an operation in a neighbouring country. During the operation, surgeons placed iron pins along the lower part of his leg. After a while, pain began, then he could no longer stand or sit for periods of 10 minutes. Hence he was given crutches to assist him. 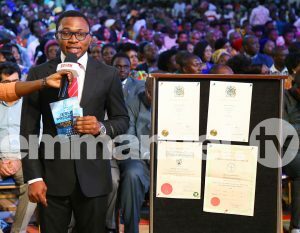 Unable to bear the pain anymore, Mr Uche came to The SCOAN where he received prayer from Prophet T.B. Joshua. 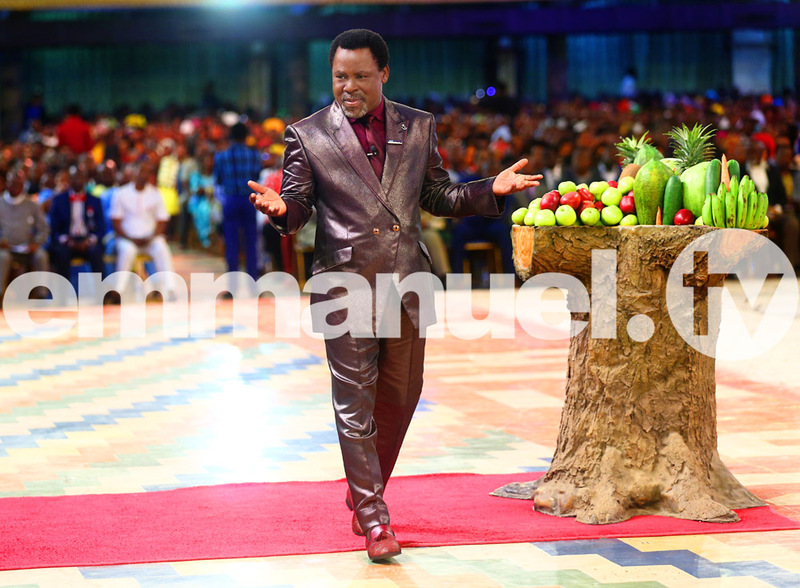 As he testified before the congregants and viewers all over the world, he described the encounter as follows, “I saw a flame of fire coming from his hands. I lost control when the man of God prayed for me. The weight on my waist was broken and I started walking.” He further explained that that was the last day he used his crutches as he threw them away. He concluded that Prophet T.B. Joshua is a man sent by God to set people free from pain and tribulations, in Jesus’ name. 38-year-old Miss Ene Victoria Ogbodo, a civil servant from Benue State, Nigeria, was involved in an accident that fractured her distal fibula restraining her to the use of a pair of crutches. Despite the use of the crutches, Miss Victoria still had to rely heavily on her younger sister whenever she needed to use the bathroom or toilet. The severity of the broken distal fibula caused a shift of the ankle, as her x-ray showed. Having exhausted all medical and traditional treatments without any solution in sight, she left Abuja for The SCOAN with a conviction that her case was finally settled. To God be the glory, her prayers were answered. As soon as the Man of God prayed for her, she got on her feet and started walking to the glory of God. “Thank You, Jesus! I can walk” filled the auditorium. With exceeding joy in her heart, she dropped the crutches on the floor and walked freely in Jesus’ name. 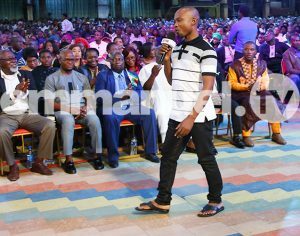 Mr Kalejaiye Adesoji, a zealous scholar, testified during The SCOAN Live Sunday Service of how God had raised him from the pit of failure to the peak of success. He recounted his experience of how he was given admission to study law in the United Kingdom after the completion of his secondary school in Delta State, Nigeria. But everything changed when he got there and he started experiencing academic challenges; his grades began to drop drastically. To his dismay he was advised to withdraw or accept a third class – something he could not comprehend with. 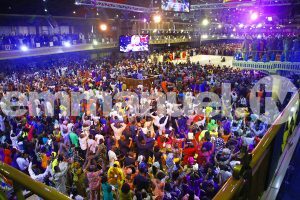 He knew the situation was not ordinary and in search for a solution, he thought it wise to visit The SCOAN where he was prayed for by Prophet T.B. Joshua and also given the New Morning Water. He returned to the U.K. and continued with his educational career. He continued to minister the New Morning Water. To his amazement, he completed his first degree programme without a hitch and proceeded to do his Masters which he also completed with an aggregate of 69 percent. Today, he has been called to Bar as the solicitor and barrister of the Supreme Court of Nigeria. Now A happy man, he advised all faced with a stiff opposition, to hold on to God and He will see them through. Mrs Ezekiel fell a prey to the teeth of incessant nightmares that plagued her life. Every night, she was fed with all sorts of food in her dream. Sometimes had frightful encounters with old men and even dead people in the dream. These nightmares manifested in her physical life through severe stomach and chest pain. The pain was so excruciating that she could not breathe, eat or sleep well. 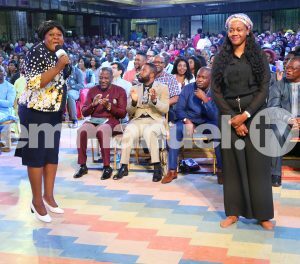 Seeing that Mrs Ezekiel’s condition was deteriorating rather than improving despite all the medication and treatment she was receiving from doctors, her relatives advised her to visit The SCOAN to seek God’s help for a lasting solution. 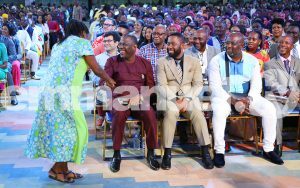 Mrs Ezekiel attended The SCOAN Live Sunday Service and was seated in the overflow section. Knowing that distance is not a barrier to the move of the Holy Spirit, she believed that God would touch her case and as soon as the Man of God started the Mass Prayer, she began to feel uneasy within her. Her stomach began to rumble. She explained that she felt a push from within her and immediately, she began to vomit bloody and poisonous substances that she had eaten from the table of the enemy. 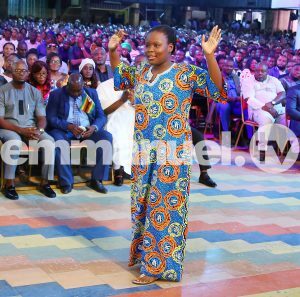 Looking radiant today, Mrs Ezekiel advised the congregation and viewers all over the world to turn to God for solution to their problems. 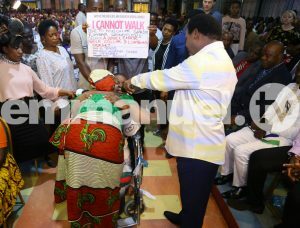 The unbearable pain Pastor Cornelia Shiweda from Namibia suffered in the knees as a result of arthritis was so severe that it affected her mobility, causing her difficulty in walking despite the knee brace she had on. The doctors recommended an operation and had booked her for such but Pastor Cornelia refused it, for in her heart, she believed that a permanent solution could only come from the Great Physician, Jesus Christ. “I could not stand or sit for long and decided that I was not going for an operation” she recalled. Speaking of the glorious day she was finally set free, Pastor Cornelia said that Prophet T.B. Joshua stretched his right hand towards her without even touching her. “I felt a shock in my right knee. He told me to stand up”, she added. The knee brace was removed and she was able to walk freely. By now, all the pain she was experiencing had vanished. Her daughter Miss Fredrika Gabriel stood to give thanks to God for the wonderful miracle He had performed in her mother’s life through His Son, Jesus Christ.